Olympia Auto Mall - Washington's Largest Selection of New and Used Cars: Synthetic Versus Standard Oil- What’s the Difference? Synthetic Versus Standard Oil- What’s the Difference? Anyone who has a car has to use oil. Most people know by now that there are two main types of oil in the marketplace: standard oil and synthetic. So what’s the difference? Don’t worry, we’re here to help. In order to understand different motor oils and what they do we must identify what each one is and why it is important. Simply put, standard motor oil is oil that has been directly derived from natural crude oil. Synthetic oils are, by definition, substances made by using chemical processes to mimic the real thing. In this case scientists figured out how to synthesis various chemicals to mimic conventional motor oil. So what about the different labels on oils? 10w-30, 15w-40, and so forth; what do they mean? To understand different oil ratings we have to get scientific on you. First, let’s point out the “W” in the room. W stands for winter, not weight as some might think. However, weight is a part of the formula. The 10 means that when it’s cold your oil has the viscosity of 10 weight oil and at higher temperatures it has the viscosity of 30 weight oil. Clear as mud? Okay, let’s look at this a different way. Oil is an interesting material, when it gets hotter it gets more viscous (thick, semi-liquid). When it cools, it gets less viscous. Think of it as the opposite of water. Water, when it gets cold becomes more solid and hotter becomes less solid and more like a gas. Hopefully that cleared things up a bit. Alright, on to what you came here for. So what’s the difference? It really comes down to how often you need to change your oil. Conventional oil is recommended to be changed every 3,000-5,000 miles. Synthetics, you could go up to 7,500. Synthetic oil costs about twice as much. But many mechanics claim that synthetics will produce less wear on your engine over time prolonging its life and even improving your fuel economy. We get asked all the time, “Once you go synthetic can you go back?” The short answer is yes, oil is compatible no matter whether it is conventional or synthetic. Switching the rating around on the oil often is not advisable. Not using the right kind of oil in your car could void the warranty. So how do I know what is the right kind of oil to use for my car? Just look under the hood. 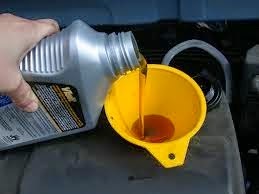 Yep, most cars have the recommended viscosity imprinted to the oil cap. If not you can either find the right oil recommendation in your owner’s manual or call your friendly service team at the Olympia Automall. Those nice people! So there you have it. Don’t you feel smarter? We thought so! Whether you choose synthetic or conventional oil our experts at the Olympia Automall are here for you. Learn more by checking out the rest of our blog or visit us on the web at www.olympiaautomall.net. We’ll help you keep your car maintained to maximize its value and utility. If you’re looking for the best new and used cars Olympia Wa has to offer come to the Olympia Automall.